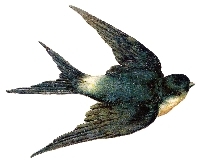 I'm going to start a series of bird ATC's and first up in the beautiful swallow. In the series I'd like everyone to put the first letter of the type of bird on the card; for this card you'll include the letter, 'S'. Any suggestions for 'bird on deck' are most welcome and thank you all for your dedication to your art.